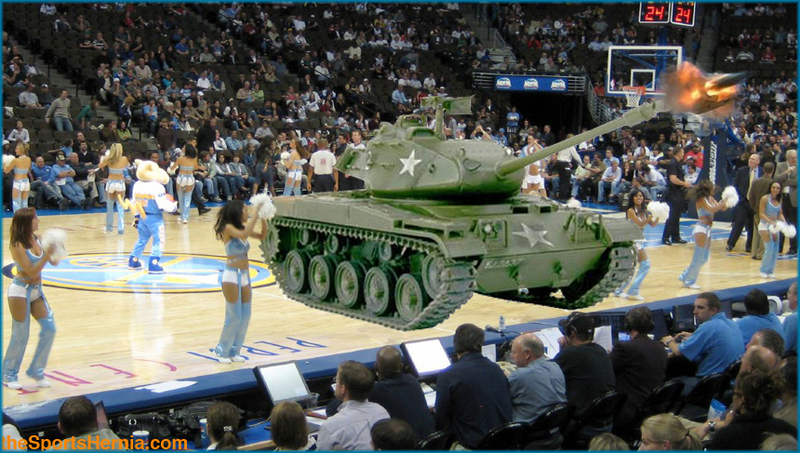 (DENVER, CO) — With NBA crowds insatiable desire for free t-shirts at an all-time high, the NBA rolled out the highly controversial Shirt-Tank 3000, which will replace all wussy powered shirt-rockets by the end of the January. The ST-3000's debut Monday in Denver was a wild success, with over 1,000 t-shirts fired in under two minutes and only 23 fan casualties (15 from blunt traumas to the chest and head, and another 8 to fan murders over contested shirts). Make em say uhhhhh…na na na. Haha awesome post. “Just like a real tank it can kill you”. Brilliant! haven’t we learned anything from the death of Maude Flanders?